All products you purchase or sell in Idealpos system are called Stock Items. 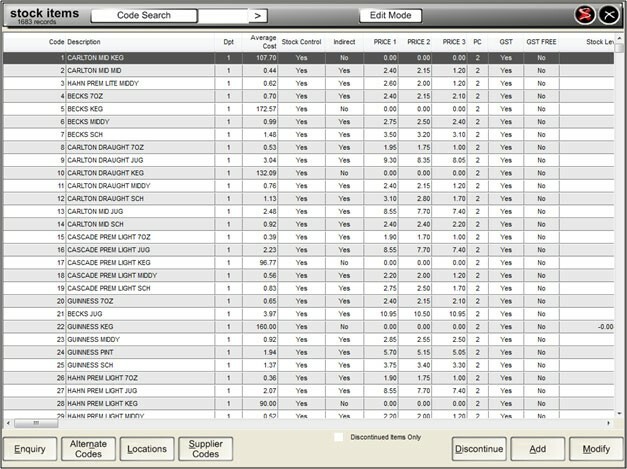 The Stock Item screen is one of the primary data editing screens in Idealpos. From this screen, you can manage all of your products with the ability to add new products, change prices and much more. The process to add a new product to Idealpos is very easy. Once the item has been added through the stock item screen, you then add the button on the POS screen. These changes are sent live to the other POS Terminals on the network. Changing selling prices can be performed quickly through the edit mode function. This function allows you to use the grid to select item prices and change them quickly.